The City of Colby has a number of lots available in the City’s Industrial Park. Below is a map of the available lots. They are noted with acreage. Utilities are available to all lots. 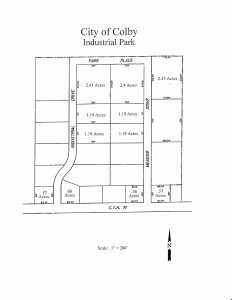 The Industrial Park is located on County Rd N which intersects with State Hwy 13 in the City of Colby within 1 mile. The price per acre of land in the Industrial Park is negotiable depending on type and value of improvements using this scale as a guide. Purchaser must make the negotiated improvements to the lots within two (2) years or sell the lot back to the City of Colby for the original purchase price. For more information, call the City Clerk at 715-223-4435 or contact her at 211 W Spence Street, Colby, WI 54421 during regular business hours, Monday – Friday 8:00 am to 4:00 pm.